This summary was taken from the Beachy Head log which I have maintained since the 1960's, and it includes records from local observers. 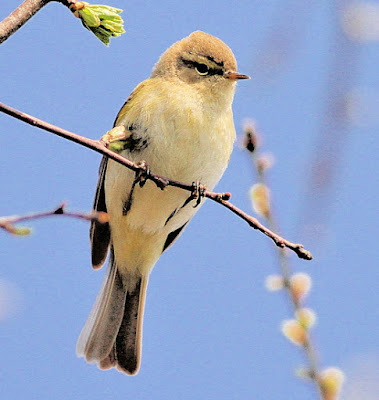 This Spring's, observer coverage was at a very low level, many thanks to Bob Edgar who provided his information, but otherwise very few observers were covering the various birding sites. Doreen and myself concentrated on sea-watching from Birling but from early May, I unfortunately suffered some heart problems and this has prevented me from visiting Beachy and therefore very little sea-watching was carried out during May. This Spring has proved very difficult searching for night migrants not only at Beachy Head but at other sites along the South coast and with migrant numbers appearing now at a very low level and with fewer observers now checking the sites the numbers reported of common migrants are at a very low count. In recent Springs, the numbers of migrants being seen on Beachy Head has fallen quite dramatically, and this has discouraged observers from now birding on the Headland. Spring sea-watches: Recorded on 10 dates from 5/3 (1) to 11/5 with a total of 17 E with the daily max: 11/5 (7E). Jan-Feb: Recorded on 10 dates from 5/1 to 18/2. A total of 129 seen of which 37 E, 71 W and the remainder were on the sea. Daily max: 60 on the 12/1. Spring sea-watches: Recorded on 29 dates from 5/3 to 11/5 with a total 0f 954 of which 931 moved E. Daily maxs: 5/3 112 E & 2/4 (102 E). Jan-Feb: Just seen on 3 dates with a total of 9. Spring sea-watches: Recorded on 18 dates from 5/3 to 23/4 with a total of 58 seen during this period and a daily max: 6/3 (10). 2/4 ( 3 in s/p sat on the sea KG & JFC), 6/4 ( 2 s/p E RAB) & 15/4 (6 in s/p sat on the sea (KG & JFC). This now brings our total to 51 since 1960, of which 43 have been seen since 2000. Spring sea-watches: Recorded on 7 dates: 4/4 (1E), 6/4 (1E), 16/4 (15 E), 17/4 (2E), 18/4 (7E), 23/4 (2W), & 28/4 (7 : 3E & 4W). Jan-June; Generally only small numbers recorded during the sea-watches during this period with daily maxs: of 10 on the 18/2 and 13/5. Jan-Feb: Recorded on 11 dates from 2/1 to 18/2 with a daily max: 13/1 (82 chiefly E). Spring sea-watches: Max.movements: 6/4 (190E), 16/4 (221E ), 28/4 (203 E) & 11/5 (353E). During the 1960's the daily max. never exceeded 45 birds. Single flock of 85 high W on the 18/2, otherwise just small numbers seen. Spring sea-watches: 16/4 (1 E KG) & 1/5 (1 ad. s/p E (JFC & DRC). Just singles recorded on 3 dates 16/4, 1/5 and 11/6. One flew over the Headland on the 21/3. Spring sea-watches: Recorded on 4 dates from 12/3 to 17/4 with a total of 18E with a daily max: 12/3 flock of 17E. Spring sea-watches: Recorded on 8 dates from 12/1 to 17/4 with a total of 41 E. Daily maxs: 6/4 (17E). 7/4 1 drake E with Scoters @ 09.43.RAB and AR. Spring sea-watches: 6/4 (2 E), 17/4 (1E) & 19/4 (2E). Spring sea-watches: 12/1 7E, 14/3 2E & 2/4 11E. Spring sea-watches: Recorded on 9 dates from 11/3 to 19/4 with a total of 71 E. Daily maxs: 6/4 (28E) and 7/4 (21 E). 2018: Spring sea-watches: Recorded on 6 dates from 14/3 to 27/4 with a total of 22 E. Daily maxs: 6/4 (6E) and 27/4 (6E). No repeat of last year’s totals which was a little surprising consider the large numbers of Common Scoters which were seen moving this Spring. 2018: Jan-Feb: Recorded on 5 dates from 2/1 to 30/1 with a total of 72 with a daily max: 9/1 60 W.
Spring sea-watches: Recorded on 35 dates from 5/3 to 11/5 with a total of 12,896E. Daily maxs: 2/4 (1,442 E), 4/4 (1,800 E), 6/4 (2,002 E), 15/4 (3,017 E). At one time on the 15/4, 850 were counted sat on the sea before moving off E.
Our 2nd best ever Spring movement. In 1979 a total of 19,319 moved E with an unprecedented peak of 13,293 E on 8/4/1979. Spring sea-watches: Recorded on 8 dates from 27/1 to 21/4. A total of 37 E with a daily max: 15/4 (13 E). A small improvement from last year which was our worst Spring to date. Numbers seen on our recent Spring sea-watches are much reduced from the numbers moving during the early part of this century. For example in 2004 a Spring total of 344 were logged and in 2005 the total was 281. Spring: Recorded on 20 dates from 9/1 to 11/5 with a total of 132. Daily maxs: 19/4 25 (23 E and 2 W), 27/4 (17 E). A pair were prospecting around Birling from 20/4 to 23/4 and on the 3/5 5 were standing on top of the cliffs near Birling. Jan-Feb: Recorded on 5 dates between 9/1 to 27/1 with a total of 86 E.
Spring sea-watches: Recorded on 28 dates from 5/3 (110) to 3/5 (1). A total of 5,207E with daily maxs: 3/4 941E, 4/4 501E and 15/4 658E. Spring: Recorded on 6 dates from 11/3 to 17/4, but never more that 3 on a day. 26/3 3 adults coming straight in off the sea going inland, & 15/4 1 W off Birling. Recorded on 5 dates from 13/3 to 11/4 with a daily max: 13/3 4 over Long Down. Singles were recorded on just 4 dates from 10/3 to 25/4. Recorded on 4 dates: 15/4 (7, 1 moving over the cliffs W @ 10.00 & 6 E during the morning (RHC). (20/4 8 E, 21/4 2, & 23/4 1 E). A total of 18 individuals. 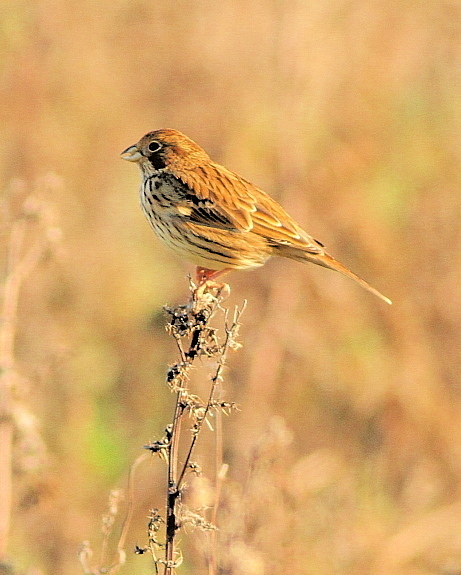 Our best year was in 2011 when 31 birds were recorded. One ENE over Went Hill at 12.15 then over Beachy Head Pub at 12.50 on the 21/4. (LP and J.Partridge). Our 9th record since 1960, with the last record was in 2011. Recorded on 15 dates between Jan to April although only single birds were seen on a day and probably all related to a single male bird which has been present for the several years, and breeding was not suspected. 23/4 1N over Headland & 26/5 1 present in Whitbread Hollow. Our earliest Spring date was on the 19/4/1997. 26/3 1 fly-thru over Birling (JFC and RE), 20/4 1 over Headland (LP). Recorded regularly from March to June. 2-3 pairs present on the cliffs from Icky Ridge to Crowlink. On the 15/4, 3 were dog-fighting out to sea off Birling and this probably related to one of the local pairs and an intruder arriving. Present from March to May in the Birling to Belle Tout area and chiefly in the Cornish Farm field. Usually 2-3 birds seen but on the 3/5, 5 different birds were present in this field. Just odd single birds seen. 21/2 1-2 calling in Whitbread Hollow, which may relate to the single bird present late last Autumn in Whitbread Hollow and probably wintered here. Regularly recorded on the beach at Birling with the daily maxs. were seen in Jan with 15 on the 9/1. On the 24/3 4 E (were quite a long way out to sea and flying very purposefully and were considered to be migrants moving). 27/2 1 on the beach at Birling (probably a cold weather migrant). 25/6 1 W over the Headland. Spring sea-watches: 22/4 2 E.
20/3 1 flushed from top of Birling lane. 24/2 (1 seen in Whitbread Hollow). Recorded on 11 dates from 9/1 to 4/5. Probably up to 6 birds wintering on the beach at Birling although odd migrants are seen moving E on the sea-watches. On the 5/3 1 arrived in over the cliffs at Shooters Bottom and headed high inland. Spring sea-watches: Recorded on 15 dates with a total of from 7/4 to 11/5 with a total of 179 with daily maxs: 17/4 (43E) & 22/4 (50E). A slight improvement with numbers logged this Spring compared with recent Springs, although in 2011 a total of 661 were logged and our best year to date was in 1976 when 960 were logged. Spring sea-watches: Recorded on 6 dates from 14/3 to 7/5 with only a total of 37E. Daily max: 22/4 (16E). 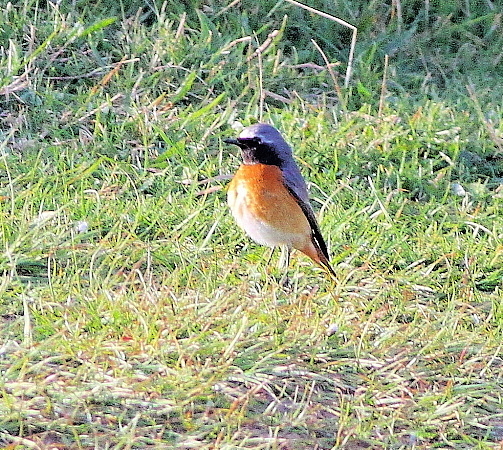 6/4 1 seen at Birling. Spring sea-watches: 24/3 (1 E), 19/4(4 E), 11/5 (1 E). Spring sea-watches: Recorded on 5 dates from 3/4 to 11/5 with a total of 13E with a daily max: 23/4 (7E). Spring sea-watches: 14/3 6 E @ 08.15. Spring sea-watches: Recorded on 18 dates with a total of 197 from the 29/3 to 11/5. Daily maxs: 3/4 (15E all dark phase birds), 15/4 (39 E), 17/4 (24 E) and 19/4 (22E). Our best Spring since 2012 when 301 were logged. Spring sea-watches: Recorded on 12 dates, with a total of 88E from 30/3 to 4/5. Daily maxs: 16/4 (20 E), 17/4 25 E, 2/5 12 E.
An above average Spring passage, although our best Spring to date was in 2012 when 292 were logged. Spring sea-watches: Recorded on 5 dates from 1/5 to 11/5 with a total of 27 with also 2 probable's were also seen. This year Poms. were seen off Splash Point during several afternoons when no observers were watching from Birling. 12/3 One of the English race graellsii was off Birling. 6 /4 400 in ploughed field near Belle Tout. Our first Beachy Head record, and its been a long time coming. 9/1 300-400 chiefly adults were present in the fields at Birling. 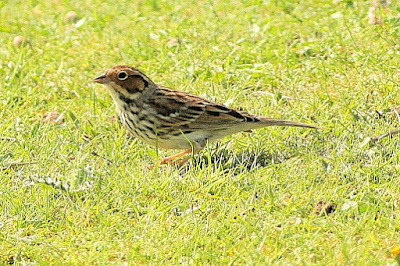 Birds were present around Birling to early May and on the 16/4 120 mainly immatures moved E off Birling. Spring sea-watches: Recorded on 18 dates from 5/3 to 11/6 with a total of 359. Daily maxs: 16/4 72E, 17/4 120E and 18/4 73E. Spring sea-watches: Recorded on 7 dates with a total of 395E from 2/4 to 19/4. Daily maxs: 2/4 (42E), 6/4 (110E), 15/4 (131E) & 19/4 (100E). Once again very little sea-watching was carried out during the evenings when Little Gulls are being seen at other coastal sites, but even so another good Spring. Our best Spring occurred in 2007 when a total of 517 were logged with 400 on the 21/4/07. Spring sea-watch: Recorded on 15 dates from 29/3 to 11/5 with a total of 369E with daily max: 1/5 52E. Spring sea-watches: Recorded moving East on 17 dates from 5/3 to 11/5 with a total of 2,915E. Daily maxs: 14/3 665E, 29/3 c520E, 3/4 c700E, 11/5 c500E. With the breeding colony of Kittiwakes at Seaford Head, it does prove difficult to decide if birds are actually moving or the adults from the colony are just moving to feeding grounds. Spring sea-watches: Recorded on 16 dates from 2/4 to 11/5 with a total of 2,579. Daily maxs: 6/4 507E, 19/4 1,025 E.
With the general lack of observers now sea-watching from Birling and virtually all the watching is carried our during the early morning, many Commic Terns are now missed as large recent movements are recorded at other sea-watching sites during the evening when there is no one watching from Birling. Spring sea-watches: Recorded on 28 dates from 6/3 to 11/5 with a total of 2,519 E. Daily maxs: 3/4 320E, 6/4 (702 E, (of which 387 were seen during the evening). Our largest number seen this century, but during the 1970’s over 4,000 was regularly logged during the Spring sea-watches. Spring sea-watches: Just a total of 19 were identified this Spring. Spring sea-watches: Just a total of 10 were identified. Jan-Feb: Recorded on 7 dates from 9/1 to 18/2 with a total of 98 and daily max: 27/1 52E. Spring sea-watches: Recorded on 15 dates from 5/3 to 11/5 with a total of 368. Daily maxs: 6/4 155 E & 16/4 87E. 11/5 A single bird was flushed from the road by Birling Manor which may very well be a local breeding site as over the years I have seen a number in this area. 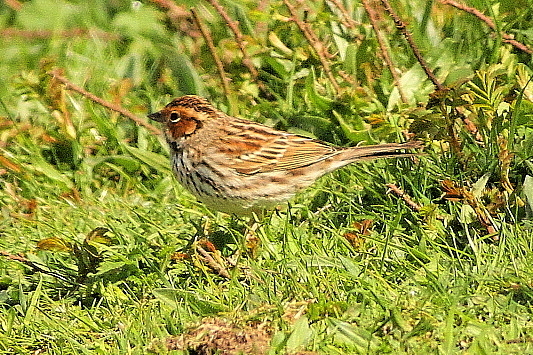 A flock of around 50 spent most of the Spring feeding in the Cornish Farm field and roasting in Belle Tout wood. Recorded on 7 dates from 21/3 to 11/6 with a total of 10. Majority were seen moving north up Birling lane but on the 7/4 1 was present above Belle Tout wood. Pairs present in the Whitbread Hollow/Holywell areas and Belle Tout wood. 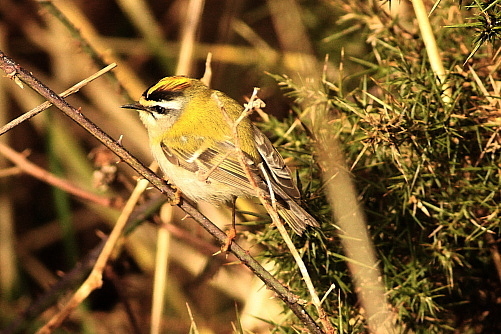 The Belle Tout wood pair were not seen until mid-April and a single bird was found dead close to the road. One seen on the 27/4, but no further reports after this. Our 16th record of 17 individuals since 1960. 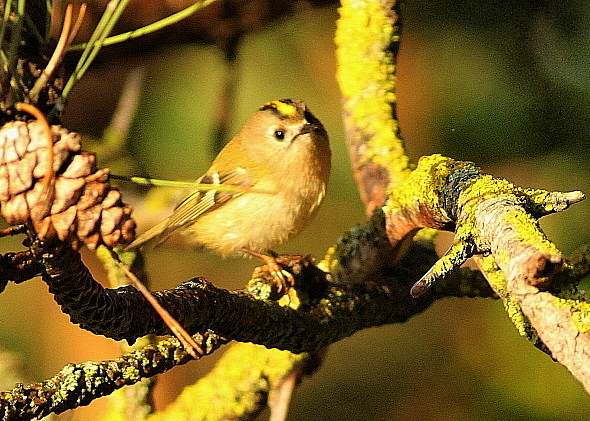 Recorded throughout the Spring but sadly in very low numbers. There appears to be just 2-3 birds present on the Headland and just 1 bird in the Whitbread Hollow/Rides area. The maximum number seen on any one day was just 2-3 birds. Singles recorded on just 5 dates from 10/3 to 13/4 which may all relate to just one bird. Skylark Jan-Feb: Only 50 were present in the set-a-side field opposite Belle Tout wood on 2 visits made during this period, with just 25 seen on the 6/3 in the field. This field did not appear so suitable for birds during the early part of this year. Spring: Recorded from 7/4 with 1 in off the sea. Very low numbers logged during this Spring and only 25 recorded arriving on all the sea-watches. 4 pairs breeding at Hodcombe. Spring: 18/3 (1 Birling) & 23/4 (2). Spring: Just odd birds logged on 16 dates from 15/2 to 1/5 with 3 on the 22/4. 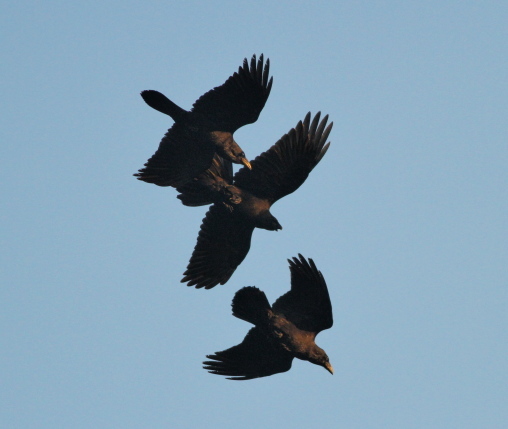 Three Ravens tumbling above the Old Trapping Area. Only 3 were seen coming in off the sea on the Spring sea-watches: 21/4 (1) and 23/4 (2). Spring: A pair were present in Whitbread Hollow on the 23/4 and 25/4. Spring: 14/3 Party of 8 flew out of the bushes and departed quite high in the sky at the top of Birling lane. Nine pairs were occupying the nest boxes in Whitbread Hollow. Spring: Numbers were scarce during the early part of the year and only 2 pairs found breeding in the nest boxes in Whitbread Hollow. Spring: Recorded on 5 dates from 7/3 to 23/4 with pairs recorded from Whitbread Hollow, Belle Tout wood, Cliff Path and Cow Gap. Spring: Reasonable numbers were present in the whole area with two counts made on the Headland: 13/3 10+, & 24/3 12. 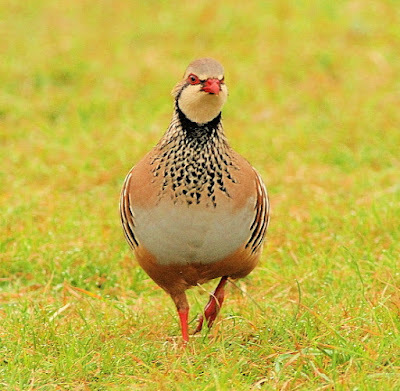 Reasonable numbers were also reported in Whitbread Hollow and during the breeding season a number of pairs were holding territory in the area. 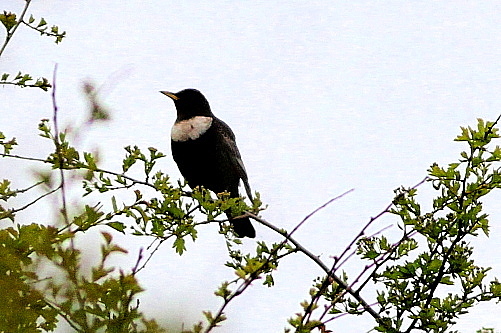 Spring: Just a single bird seen on the 1/4 in the Warren Hill Valley. Spring: None recorded again this Spring our 5th Spring running that none have been seen. On 26/1 6 were seen on the Headland, but no other influxes were noted. Spring: Small numbers seen from 9/3 with a daily max: of 6 singing birds chiefly in Whitbread Hollow on the 22/3. 2 pairs probably bred in Shooters Bottom and the adults were seen collecting food. 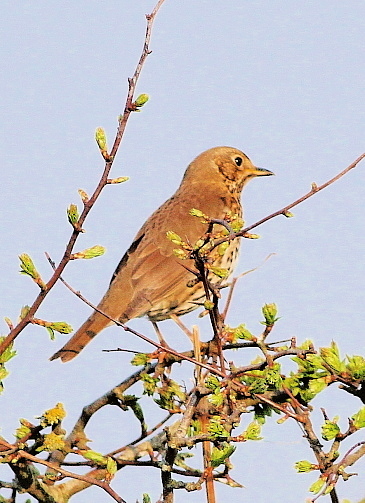 One of the local Song Thrushes in Shooters Bottom. Spring: Singles recorded on four dates from 13/3-30/3. Spring: Recorded on 6 dates from 16/4 to 29/4. Total of 14 bird-days with a daily max: 16/4 (4). Spring: Present throughout the Spring. Small influx noted on the 16/3 with 12 all males noted in Shooters Bottom. Spring: Recorded on 15 dates from 18/3 to 3/5. A total of just 47 bird-days with a daily max: 1/5 (20). A poor Spring generally for night migrants. 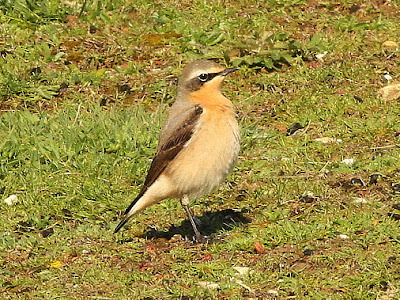 Always look forward to the first male Wheatears of the Spring. Jan-Feb: Two was present in the Birling area. Spring: Daily max; just 8, but no proper breeding survey carried out although it was considered that a fall in the number of breeding pairs. On the 16/3 2 rubicola males were identified with 1 on Icky Ridge (photo) (JFC) and 1 in the scrub below B/T lighthouse (RDME). Spring: Just recorded on 4 dates from 7/4 to 23/4 with 5 bird-days. Although it was a very poor Spring for migrant birds along the South coast, observer coverage in our area was also probably at an all time low. Spring: Recorded on 15 dates from 13/3 to 7/6 (adult male). A total of 20 bird-days with a daily max: 8/4 (4). Probably 12 different individuals involved. 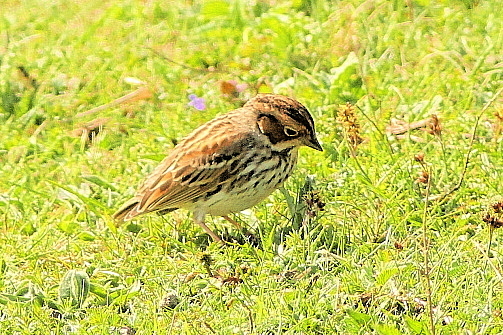 The adult male seen in June may possibly relate to a local breeding bird. RHC also mentioned that he had seen a number of other Black Redstarts during this Spring but which are not included in the above totals. 2018: Spring: Reasonable numbers present in the area ie on the 21/3 12 were seen around the bungalows at Birling. No real sign of any arrivals during this Spring. An adult male was present from 2/1 to 22/1 and seen on 3 dates in the gorse above Belle Tout wood. It was looked for subsequently but not seen. 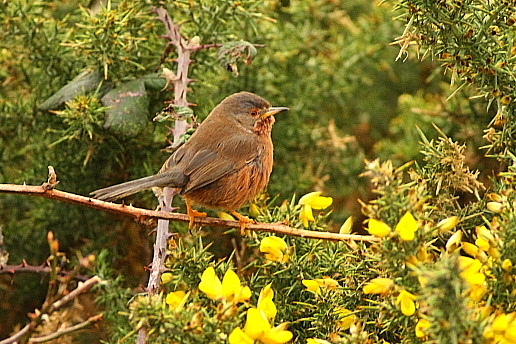 Dartford Warbler above Belle Tout wood. Spring: Recorded on 16 dates from 12/3 to 11/6 with a total 0f 49 bird-days and Daily max: 16/4 13. 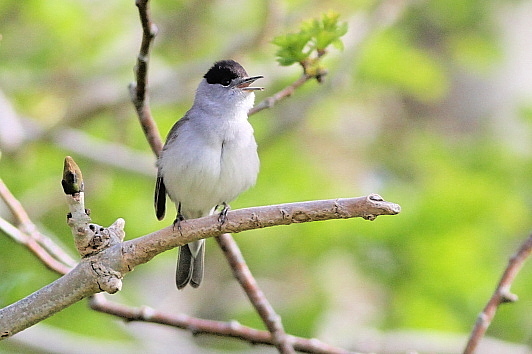 Male blackcap in full song in Belle Tout wood. Spring: Just recorded on 3 dates, 27/4 (2), 29/4 (1) & 1/5 (1). As with the majority of night migrants very low numbers have been recorded along the coast and also lack of observer coverage. Spring: First seen 18/4. Very few migrants recorded in our area this Spring and also lack of coverage by observers with a daily max. of only 7 Whitethroats recorded. Must be our worst Spring for this species. Spring: Recorded on 13 dates from 16/4 to 21/5. But never more than 2-3 on a day. Two singing males appeared to be holding breeding territory in Shooters Bottom and in the scrub below B/T lighthouse. 2018: Spring: Recorded on 16 dates from 10/4 to 1/6. A total of just 94 bird-days with daily max: 20/4 (25). A very poor Spring and probably our worst to date. Again very low numbers of night migrants present this Spring and also very low observer coverage. Willow Warbler in the Old Trapping Area. 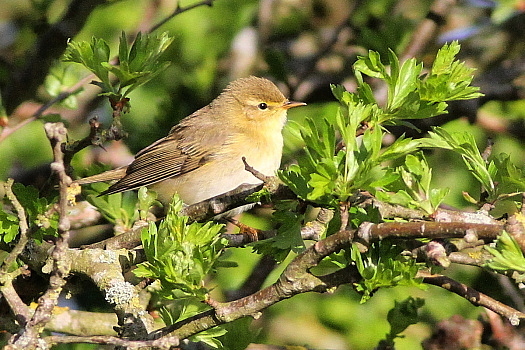 Poor Spring for Willow Warblers this year. Spring: Recorded from 12/3-11/6 with a total of 143 bird-days. Daily max: 10/4 (22). Several birds were holding territory. As with other night migrants, a very poor Spring. 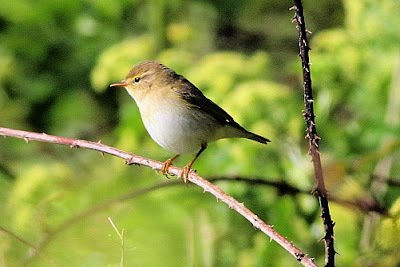 Chiffchaff along the Cliff Path. Spring: Two singles on the 14/3 & 7/4. Spring: Recorded on 13 dates from 12/3 to 20/4. A total of 33 bird-days with daily maxs: 26/3 (5), and 8/4 (9). Probably 26 different individuals involved and RHC reported 2 in Hodcombe during the Spring making a total of 28 different birds. Spring: Recorded on four dates: 29/4 (1), 1/5 (1), 26/5 (2), 1/6 (1). Spring: 16/4 & 17/4 (1 female B/T wood), 29/4 (1 male B/T wood) Also RHC reported 3 different individuals during the Spring. 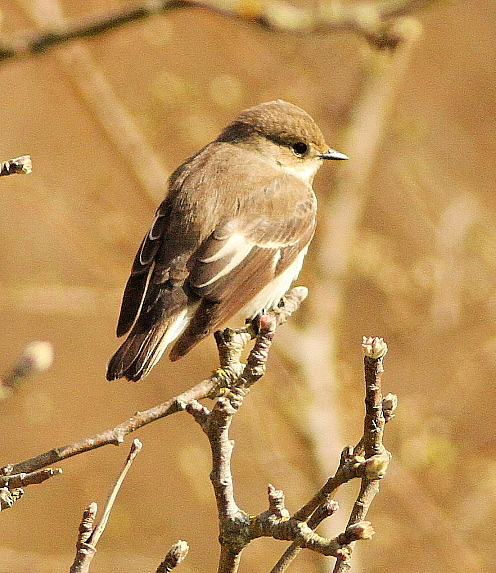 Female Pied Flycatcher in Belle Tout wood. Good numbers were present in the whole area. 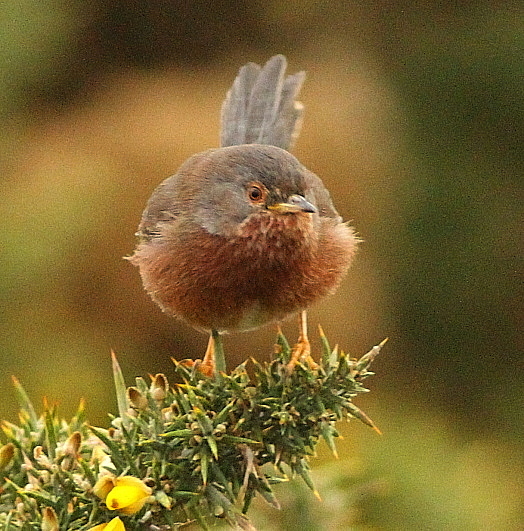 On the Headland on the 21/3 a total of 30+ were seen. Spring: First small arrival of 12 on 21/3 and on the 26/3 12 of which 7 N. Otherwise very low numbers logged. Spring: Just one record 27/4 (1). Spring: Recorded on 16 dates at Birling from Jan to May, but never more than 4 on a day and odd birds were seen in flight display. None recorded elsewhere in the area. Spring: Very few birds seen this Spring with never more than 3 on a day. 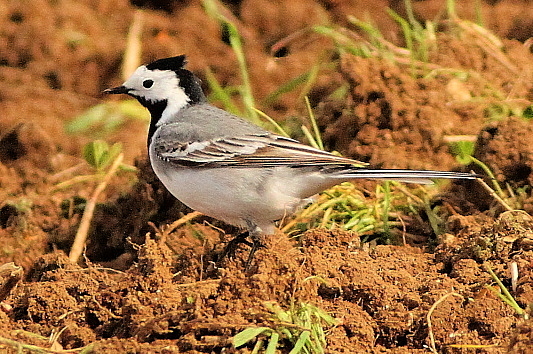 Only 6 Alba Wagtails were logged moving over the area. 2018: Spring: Only recorded on 4 dates: 6/4 (2 in ploughed field), 7/4 (8 in ploughed field), 8/4 (1 in Whitbread Hollow) and 9/4 5 (4 in ploughed field and 1 in Shooters Bottom). Eight is out largest total recorded on a single day. 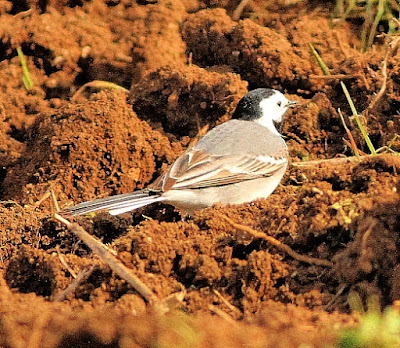 Probably as many as 13 different birds were seen this Spring as the ploughed field was checked throughout this period and none were seen on the 8/4 feeding in the field. Spring: 3/5 1 flew over the Headland. Spring: 26/3 (1 female briefly Old Trapping Area) and 1/4 (1 Whitbread Hollow). During Jan and Feb, up to 35 present in the set-a-side field, but by March just 9 were left. 20 were present on the Headland late March. Spring: 26/3 1 in Whitbread Hollow. 2018: 27/1 (25 in set-a-side field). Spring: 13/4 (Flock of 150 feeding in ploughed field), 18/4 (25 came in off the sea), 21/4 Flock of 40 feeding on the ground). 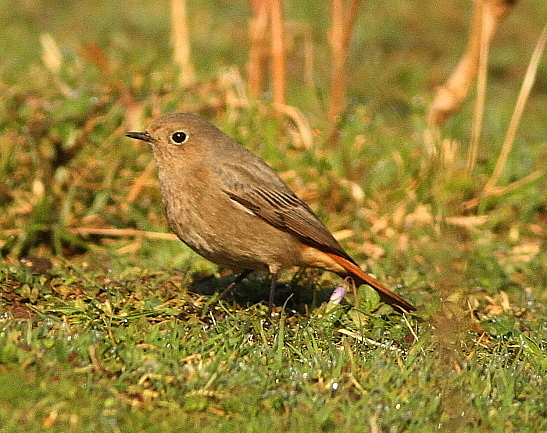 Usual numbers present in the breeding areas. Spring: 18/4 (1 in the Old Trapping Area) & 21/4 (1 on the Headland). Spring: No movements recorded. 11/4 20 were logged from Shooters Bottom, where there appears to be a good breeding population. Spring: 26/3 (2), 5/4 (1) and 20/4 (1). 15/2 (1 female set-a-side field), 9/4 (1 male side of B/T wood), 13/4 (1 male B/T scrub). 2018 22/4 (1 Shooters Bottom photos (LP, RDME, JFC, DRC et al). Just our 2nd record and the first for the Spring, since 1960. Two other probable Autumn records which were never submitted due to insufficient details obtained.